after all is said & Dunn: Real Talk - TEETH! Philips Sonicare Toothbrush - For real, this toothbrush is my baby. Although it's a bit more pricey than your average manual toothbrush; I'm telling you that it is WORTH. IT. It's extremely powerful & will probably change your life or something. I've had mine for a few years and literally just swap out the brush head every couple of months. Are you on your way to Target yet? I brush 2x per day and use Sensodyne Pronamel Gentle Whitening Toothpaste. Oral-B Glide Pro-Health Floss - Let's be honest. I absolutely would prefer to use those easy little individual flossers instead of the real stuff that makes your fingers lose all circulation (no but really isn't that the WORST?!). Alas, the real stuff is what we need to be using in order to get all the gunky sh*$ out that the flossers can't reach. BOO! Thankfully, Oral-B Glide floss is a little less harsh feeling and really does "glide" easier between your teeth. Trust me, I hate flossing just as much now as I did when I was 5. But it is absolutely CRUCIAL to maintaining healthy gums, preventing cavities and keeping your smile white. I floss 1x per day. 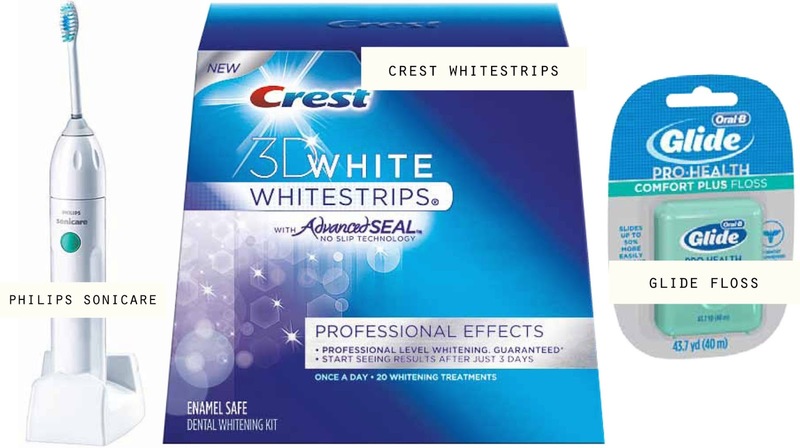 Crest 3D Whitestrips - If I could hold hands with these whitestrips I would. They're that great. I mean look at the box even! All pretty & sparkly & stuff. No but seriously this is the only "bleaching" I've ever used on my teeth. And now they've got the 'advanced seal' so they don't slip off your teeth/you can actually speak like a normal human being when you've got them on (remember the old ones? You basically had to remain mute for 30 mins until they came off in fear of half your teeth whitening while the other side slipped off. Major P.I.T.A.). The box comes with 20 packets (each has a top/bottom strip) and says to use for 20 days straight... but I wouldn't necessarily recommend that. Unless your teeth are the color of your urine in which case I would recommend you do it for 40 days straight. I typically use them for 3-5 days once or twice per year because I've got uber sensitive gums + 4 days of use seems to bleach them effectively enough. **Try not to eat or drink anything dark in color for a couple hours after you use whitestrips. The main active ingredient in most whitening formulas is a derivative of peroxide which opens up pores on your teeth so introducing a natural stain like coffee could be a disaster!